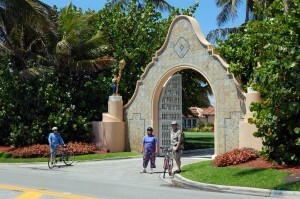 Foodie friend Jan Norris asked if I’d like to join her and some friends from New York in a bike ride in Palm Beach. Given a choice of working around the house or going on a bike ride with some new folks, it didn’t take long to make a decision. Jan was going to drive down with two extra bikes. 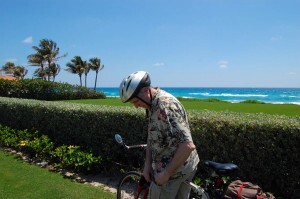 My assignment was to ride two miles from my house with a spare helmet and meet Bob Keller and Laura Hynes at the Hotel Biba just down the street from The Palm Beach Post (our former employer). The Hotel Biba was known as the Mount Vernon Motel back in 1973 when we stayed there until we could find a place to rent. Even it those days it had a reputation as a hot-sheet motel, but the price was right and it was close to the paper. Not long after that, it became a true no-tell motel frequented by extremely friendly ladies of the neighborhood. Today it’s a little more upscale. They rent by the day, not the hour. No Palm Beach trip would be complete without stopping to pose for a picture in front of the gates to Mar-a-Lago, the former Marjorie Merriweather Post estate, now a resort owned by Donald Trump (actually, he owns 51%; ex-wife Ivana managed to hang on to 49%). I pick up a fair number of new riders: friends of friends and the like. Most of them live down here, though and are used to seeing our foliage and styles of architecture. Just north of Mar a Lago, when the road comes close to the ocean for the first time, Bob put on his brakes so hard that I was almost sure I saw the tires smoke. Even for a semi-Floridian, I had to admit that the view was spectacular. The water was as blue as I have ever seen it and the 18 mph winds were kicking up beautiful lines of waves. Riding with Yankees DOES have benefits. I would never have stopped if Bob and Laura hadn’t been along. For some reason, traffic was unusually heavy. 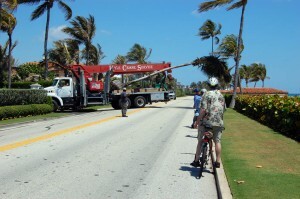 Maybe it was because drivers were using A1A as an alternate to West Palm Beach’s Flagler Drive, which is blocked off for SunFest. We were cranking along at a reasonable pace (for Yankee tourists) when a workman stepped out into the roadway to stop traffic. Seconds later, a truck transporting a huge palm tree backed up into the street. The truck drove south a few hundred feet and then pulled into a driveway on the other side of the house. I don’t know if that means that the homeowner rotates his foliage like we common folks rotate our mattresses or if the driver had pulled into the wrong driveway initially. In Palm Beach, either could be likely. 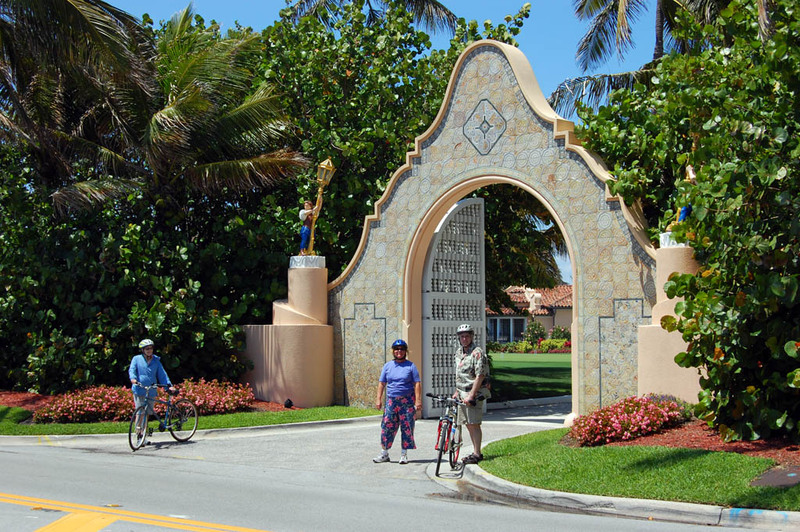 When Jan suggested that Bob and Laura fill their water bottles with chilled water from the drinking fountain, I chimed in with my normal riff about Town of Palm Beach residents being able to wave their ID cards at a sensor and, if their property taxes were paid, get an Evian upgrade. This from a New Yorker, no less. And folks wonder how Bernie Madoff was so successful. Bob shed his shirt to take advantage of the great weather. 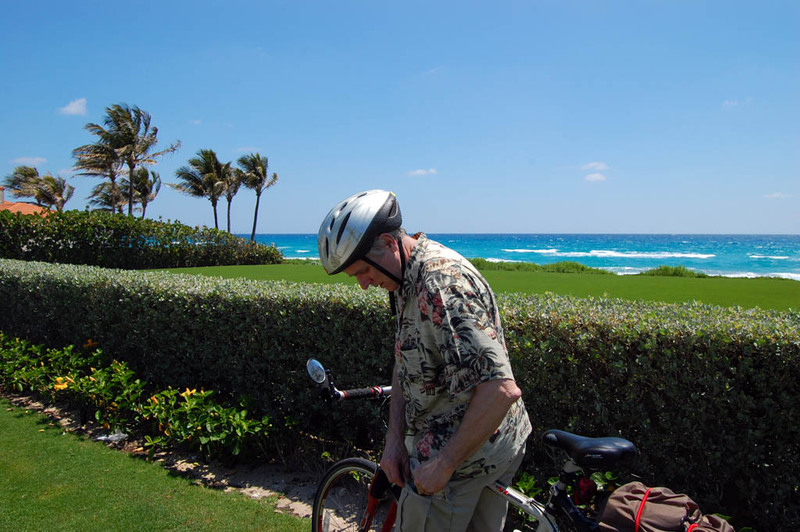 When we started to get back on our bikes, we warned him that it used to be against the law to be shirtless in Palm Beach if you were more than X number of blocks from the beach. We weren’t sure that it still wasn’t. Those New Yorkers are fast on the uptake. After being burned on the designer water dispensing fountain, they weren’t about to believe us on this. It turns out that we weren’t stretching the truth for a change. About 30 years ago, it was big news when shirtless jogger Allen Deweese was arrested because such actions offended the delicate sensibilities of Palm Beachers. It’s now safe to be shirtless in Palm Beach. At least for males. Readers may think you’ve hue’d up these photos — but I swear the skies and water were as blue this week as I’ve ever seen them — and I’m a native. Hard not to stand and stare when you’re surrounded by palm trees and can smell the salt air. We call that Chamber of Commerce weather. Sadly, it’s a short window — it’ll soon be too blazing even for you to get out and ride in daylight. You’re right. My veggie wrap was excellent and the smoothie was refreshing. I was a little surprised to get the warning to watch our bikes, but I guess it is pretty easy to hop on a bike and be over the North Bridge in the blink of an eye. I was half-hoping that someone would TRY to make off with my bike. I had it supported by the Click-Stand, which requires you to have the brakes locked. On top of that, I had my alarm cable lock on it. By the time the bad guy figured out how to move the thing, he’d have been dripping pepper spray.